I love our all white kitchen. But I wanted a pop of green above the windows. I looked all over but couldn’t find fabric I wanted. I kept coming back to the same green and white shower curtain. (It’s no longer available online, but I shared similar fabrics here.) I loved the pattern! Then I thought, I could make window valances I wanted from the shower curtain. Perfect! Shower curtain (or other fabric) – I share my favorite cheap white and green fabrics here if you’re looking for fabric similar to ours! So I started with a standard shower curtain. I didn’t want a window valance straight across but rather hanging freely with some ‘wave’. So I used took the width of the shower curtain (72 inches) as the width of the valance, even though our kitchen windows were all between 32-37 inches wide. I wanted the valances to be long enough to add a pop of color and hide the top of the blind carriage but not too long that they’d cover up our view of outside. 14 inches was the perfect length. A 1 ½-inch hem on the top and bottom of the valance added an additional 6 inches to the total length needed for each valance. Each hem required 3 inches on top and on bottom: 1 ½-inch hem and 1 ½-inch folded under for a finished look. You can use the top hem as a pocket for the curtain rod, but I planned to use these clips to hang the valance on the curtain rod. Think about if you want the pattern to be the same on each valance so all windows have the same look. I wanted the valance to have the pattern in the area shown below. Tip: Think about if you want the pattern to be centered on each valance. It all makes a difference in how the end valances look. We have three windows in the kitchen. Based on how the pattern was laid out on the fabric, we could use just one shower curtain to make three identical valances for the windows. 2. Prep the fabric to sew the top and bottom hems. Turn the bottom of the valance under 1½ inches. Then fold it up again 1½ inches to have a finished edge. Then do the same on the top side. I didn’t need to worry about this on the sides since the edges of the shower curtain were already finished. There are two options, depending on if you want the hem to show. If you’re okay with the hem showing (I was), do a straight stitch on the sewing machine. I went with green thread to coordinate with the green and white fabric. If you don’t want the thread to show, you can do a blind stich on the back side. In a blind stich, the threaded needle catches a thread or two on the back side of the panel through the folded hem, then comes back out and repeat. This way is more time consuming, but it’s worth it if you don’t want the thread to show on the front side of the valance. 4. Pick a curtain rod. For curtain rods, I went with brushed silver to match the other accessories in our kitchen – the cabinet handles, faucet and appliances. I love the crystal finial at the end of the rods for a bit of a beachy, glam look. 5. Place the clips to attach the valance to the curtain rod. I put clips on both ends of the curtain and one in the middle. And two more on each half – between the middle and the end of the curtain. We hung the rods as high as we could. The higher a curtain rod is hung, the taller a room looks (even if it’s just an illusion!). Just be sure the bottom of the valance hangs low enough to hide the blind carriage. 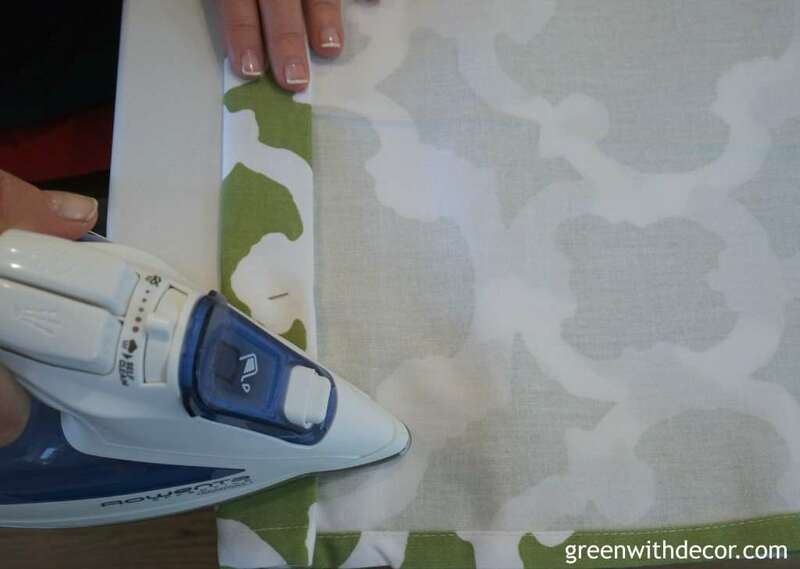 Have you ever made a window valance from a shower curtain? What do you use for window treatments in your kitchen? Curtain rods, but they’re not always available. These are similar. I also love your all white kitchen! Looks so clean and fresh. I think pops of colors are so fun and really give the room a whole new feel, like you’ve found something you didn’t know was missing! This seems so simple, or you make it seem that way. 😉 Either way I love it. That green pattern on the fabric is beautiful! I love how bright it is. This is a very clever idea! Could you just make mine for me? I would definitely purchase such a curtain from Etsy!! hint.hint. New follower from Blog Love on FB. Thanks, Terri! Haha, something to think about! I really like what you used to hang them! Great job! wow great idea! I never would have thought of this!! Great idea! I will keep it in the back of my head for the next time I need a window treatment! Thanks, Sue! Good luck with your daughter’s window treatments! Such a super cute idea!! I love the way it looks with your kitchen!! We recently moved into a new house and I’ve been working on window treatments slowly but surely. I will have to keep this in mind!! Thanks, Shelley! Good luck with your window treatments! Yes yes yes I love this – we have been looking for new curtains, I think I will have to start looking in the shower curtain area too! Thanks, Sam! Good luck with your curtains! Looks amazing!!! Your kitchen is to die for!! Beautiful beautiful beautiful! My mom always makes her own valances but these seem easy peasy I think I could manage! Thanks, Holly!! Such a bummer you can’t go to Target anymore … their home decor section is great! So pretty! What is the third one for? Thanks, Elizabeth! We have a third window near our eating area in the kitchen. This looks so good! You always find the cutest green accessories! Haha! Neat Idea with plenty to spare!